Jennifer Carroll, chef/partner of Requin in the Mosaic District of Northern Virginia has been on Top Chef. I really don’t want to start my post this way, as I imagine she is ready to get past this as a definer. But as far as I’m concerned, there really is no getting around it. Carroll’s first foray into the Bravo TV series is in Season 6 alongside Mike Isabella, whom she is now partnered with at Requin. She subsequently appeared on Top Chef: All Stars, Top Chef Duels, and Life After Top Chef. That’s a lot of Top Chef. Carroll showed off her skills with focus, determination, and a fierce sense of pride. When the judges eliminated her early on in Top Chef: All Stars, claiming her dish was bland, her reaction had to be bleeped. I was grateful to be sitting at home, where I could swear at the television without being censored. I couldn’t taste the dish of course, but the chef had won my admiration in Season 6, and I was dismayed at her early ouster. 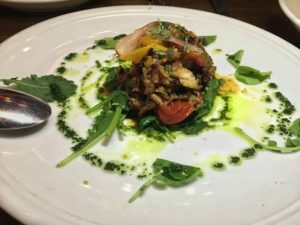 Requin, a French Mediterranean restaurant with an emphasis on seafood, provides an opportunity for me to judge Chef Carroll’s food for myself. I visit the restaurant three times before I’m ready to write about it. The time has come. It’s entirely possible to make a satisfying meal at Requin without veering away from appetizers. The selections are enticing, and on trend. Options include blistered shishito peppers, roasted beet salad with fennel and orange, garlic and herb fries, and octopus with cous cous salad. 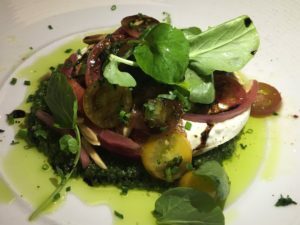 I like the burrata so much on my first visit that I order it again on the second. The current version is blanketed with tomatoes, pickled onions, almond herb pesto, and an aged balsamic glaze Two thumbs up. Yellowfin tuna tartare paired with cucumber, fennel, radish, and a yuzu-ginger broth is light and airy, making it a perfect pairing with creamy burrata. 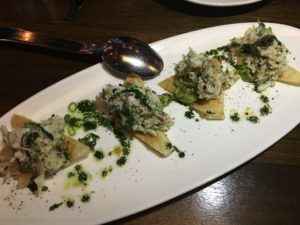 Crab flatbread with avocado and charred scallion vinaigrette gets points for its acidic notes and crunchy texture. Can I give a dish four thumbs up? On one visit we finish our mains and aren’t quite ready to move on to dessert. Brussels sprouts with fuju apple, spiced nuts, and honey is an ideal bridge between savory and sweet. It’s that one time when we say we’ll order more food later, and actually do it. I want to make this a habit. Requin showcases bounties from both land and sea in its main dishes. Crispy lamb shoulder with baby kale, melted tomato, and scallion salsa verde flatters the plate, and tastes as good as it looks. Simpler fare that appears just as promising includes roasted chicken, steak frites, and a cheeseburger that’s calling me back. 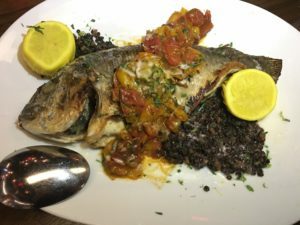 Whole dorade with lentils and smoky tomato-lemon butter is an example of how strong technique and a few quality ingredients is all it takes to make a dish memorable. Weeks after dining at Requin, my husband glances at the photo below and begins to rhapsodize over the texture and flavor of the lentils. 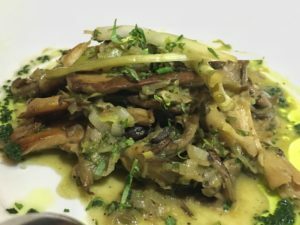 Roasted wild mushrooms are enlivened by melted leeks, pickled ramps, snap peas, and mushroom-madeira jus. It works as an accompaniment to other dishes, but it’s meaty mouth feel makes it more than an obligatory nod to vegetarians. 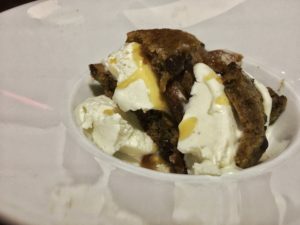 Chocolate chip cookie, vanilla ice cream, and scotch caramel sauce or “cookies and cream” as the dessert is called, is fun for sharing. A few spoons all around and its bound for rapid devouring. Requin is not necessarily the restaurant that makes you go “whoa.” Instead, it’s more a quiet declaration of wow. The word “requin” translates to shark in French. My verdict is that it’s a fitting name for the razor sharp skills demonstrated by Jennifer Carroll at her restaurant. *It was announced recently that Requin in the Mosaic District will become a casual French brasserie next year. A second Requin will open in the fall at the Wharf, featuring a seafood-focused upscale French/Mediterranean menu.